Saying goodbye to my students was incredibly difficult, as I reflected on how much each of them grew in my short time with them. My kids class was a relief to give up, although all the stress of teaching those kids was definitely worth it. My private students were especially hard to say goodbye to, because they are such sweet and hardworking students, but I got their assurances that they’ll come see me in America someday. That is a day I look forward to greatly. 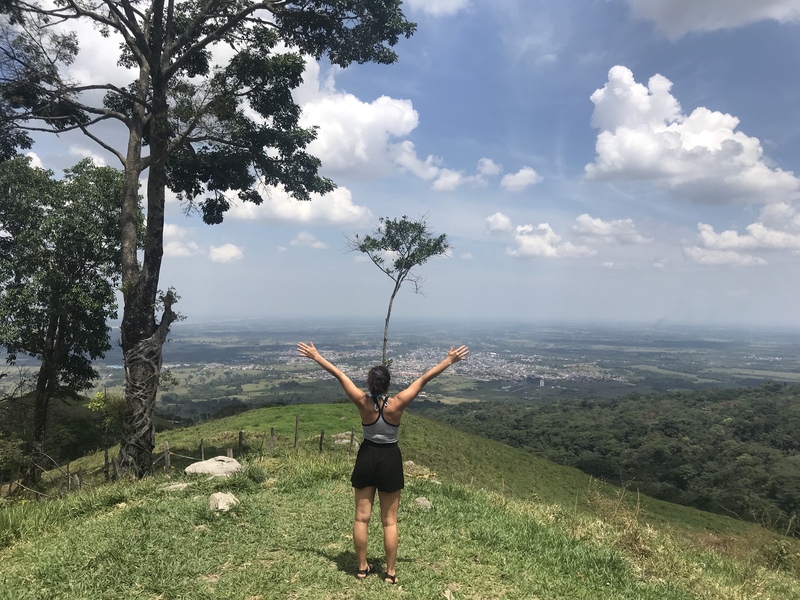 I had so many great adventures in my time here, from hikes to nights out on the town, discovering the Colombian culture has truly been a blast. Last weekend we trekked up a mountain again, and were treated to a stunning view of Acacías and the surrounding nature. I’m so grateful to have been able to spend time in a place with such beautiful scenery and people. I’ve gotten a little closer than I would have liked to many bugs, lizards, and other creepy crawlies, but it sure does make me realize how lucky I am at home. I’ll definitely miss spending my days by the pool studying Spanish, and getting to know all the other fantastic volunteers from around the world. Leaving New Western is bittersweet for so many reasons. I’m excited to get back on the road and see more, but the friends I’ve made here are hard to say goodbye to. Thanks to all of you for being the great people that you are. This beautiful kitty is Nellie, and she moved into New Western about the same time as me. She was a stray looking for a good home, and one night she snuck into my window and decided to sleep in my bed with me. It caused quite a panic when I felt some fur brush up against my leg, but that’s when I knew she was meant to be mine. I had planned to take her home with me, but a few nights ago she was attacked by a dog and passed away. I really wish she had been able to come with me, but I know that her impact in my life won’t be forgotten easily. Rest easy, my love. I’m currently en route to Bogota where I’ll spend the night, and then fly to the beautiful coastal city of Santa Marta before I continue my adventure in Chile.